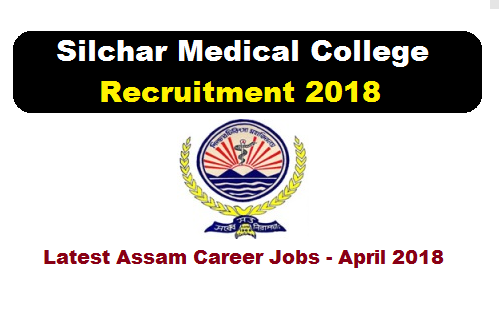 Silchar Medical College has recently issued a recruitment notification for ICMR Project in the month of April-May. According to the ICMR Project at Silchar Mediacal College Recruitment 2018 , Applications are invited for filling up of various posts under Population Based Stroke Registry project of Indian Council of Medical Research (ICMR), Silchar Medical College unit. Eligible and interested candidates may appear for Walk-in interview/ written test to be held at Administrative Building of Silchar Medical College . Following are the details of the posts under ICMR Project, for Silchar Medical College Recruitment 2018 with required qualification, salary details, age limit, experience etc. Educational Qualification: Candidates must be Intermediate or 12th pass with DEOACC “A” level from a recognized institute and / or 2 years experience in EDP work in Government, Autonomous, PSU or any other recognized organization. Candidates from science stream will be given preference. A speed test of not less than 15000 key depression per hour through speed test on computer. (i) Speed of 15000 key depressions per hour & at least 3 years experience in operation of PC. (ii) Knowledge of DTP packages and use of software programmes will be an added qualification. (iii) Knowledge of data entry, as per required norms. Selected candidate would be required to do office related work assigned from time to time. Educational Qualification : Candidates must be 12th pass in Science subjects and two year Diploma in Medical Laboratory technician course. Candidates with Diploma in Radiology will be given preference.B. Sc degree will be treated as 3 years experience. Interested and eligible candidates are advised to attend the JOB INTERVIEW at Administrative Building of Silchar Medical College at 10 AM on 4th May 2018 with original and photocopy of relevant documents, certificates, standard format of application, Biodata, recent self signed passport photograph. Candidates need to report at least 30 minutes before the interview. Candidates reporting late will not be allowed for the interview/ written test. No T.A/D.A will be given to the candidates for appearing for the interview. It may be noted that mere fulfilment of requisite essential qualification/experience does not guarantee selection. Canvassing in any form is strongly discouraged. The posts are purely temporary and on a contract basis for a duration of 1(one) year and can be terminated at any time without assigning any reasons. The job involves extensive travel within Cachar district and the candidates must have knowledge of the local languages – Bengali and Hindi besides English. The selected candidates might also be assigned additional job in addition to their allotted work if the situation demands. If selected, the candidate will have to sign a contract as per norms.